The urge to go into vaudeville was still very strong in me, and after considerable thought about the matter I decided that I would once more like to do some stage work. But this time I determined it would be a large act. Writers were secured to prepare the act, after I gave them my idea or what I had in mind. Song writers were consulted about special music. My good friend Elmore Cole, whom I had known for several years, then was kind enough to design all the apparatus. Six girls and a comedian were selected. Arrangements were made with a professional dancing teacher to teach the girls their dancing routines. Special costumes had to be ordered. All of this, as can be imagined, took time, lots of time. After several weeks of rehearsals the act was ready for what is known as “break in dates” in small theatres, usually out of town, who hired these acts for a nominal sum. It was in reality a chance to rehearse in front of an audience. The first theatre selected was the Peekskill Theatre in Peekskill, New York. The act opened. On stage there was first a backdrop (curtain) on which was painted a replica of my gymnasium equipped with barbells and other gymnastic apparatus. In the center of this curtain was a colored photograph a little more than life size in a huge frame. There were on the stage an exhibition barbell, a dumbell and a kettlebell. In the back of the stage was a rack that had six sets of wooden dumbells. There was also on stage a special built brass Roman Column and a small table about 24 inches square, that had on top of it 24 sharp pointed knives with the ends pointing upwards. If you want to keep your man. Just do this and that, soon you’ll appeal to him. Acquire a coat of tan. After this opening song, the girls went off stage, the front drape lifted, and Sam, a colored porter, was now on stage and busying himself dusting the apparatus, and started to talk: “Here it is almost nine o’clock, almost time for the Professor. The girls ought to be here too.” Just then, the girls walked on stage again dressed in street attire, stopped long enough to greet Sam, and he told them to hurry and get in their rehearsal suits as the Professor would be in any minute. Sam then talked a bit more telling them how so many ladies come to the gym. 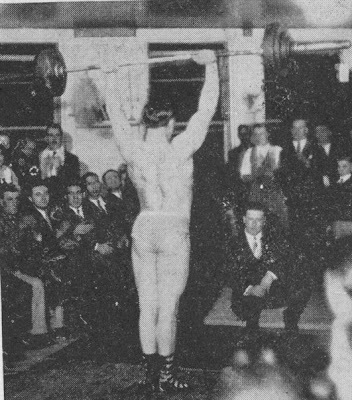 He glanced at the picture soulfully and remarked that “maybe the ladies come to the gym because of that beautiful picture.” Then scornfully remarking that he could do anything that the Professor could do and more, nonchalantly walked over to the kettlebell and tried to lift it. He tugged at it but could not budge it. Then, with a tremendous heave, pulled it off the floor, fell back and fainted! Just then stage lights were put out and the orchestra gave the impression of thunder and lightning. Like a flash, the picture was pulled out of sight, and I was posed there in exactly the same position that the picture portrayed. I first went through classical poses, and followed this with muscle control. When this was finished, the lights again were dimmed and the picture was lowered into the frame. The stage lights flashed on again and the girls entered on stage in their gym costumes. Rushing over to Sam, who was lying on the stage, they shook him, and finally he came to and told the girls that the picture was moving. They tried to convince him the picture was stationary, but he informed them that it wasn’t stationary at all when it came out and hit him with that weight. The girls told Sam that the trouble with him was that he did not get enough exercise, and he informed them that the trouble with him was that he was getting too much exercise and the exercises were killing him. Here the girls left the stage again and Sam sang a very comical song, complete with grand gestures. As Sam sang the chorus, the girls came on stage again, reached for the wooden dumbells that were in the rack, and went into a dance while going through a dumbell drill. When this was finished, Sam announced that I was now ready to put them through a drill (here I made my entrance on stage), announcing that instead of the usual routine I would perform some feats of strength with them. One of the girls sat on the floor, and bringing her knees close to her chest, I grasped one of her wrists and did a one arm swing with her, first facing the audience, then sideways, and repeating this feat, five times in all. Next I did a thigh curl with another girl, and then mounted the Roman column, which had a stairway leading up to the cross bar. On the column, I first performed a “lay-out,” keeping my body parallel to the floor. While this was being done another girl lay on the floor directly under the column. I reached back towards the floor for her and grasped her under the armpit with one hand and one of her thighs with the other hand, and slowly raised her from the floor to my chest. Then I slowly raised up until my legs were straight at the knees, looked out at the audience, and then described the steps while still holding her overhead. A spotlight followed me on stage while this number was featured. Still holding her overhead, I walked to the center of the stage, and two girls carried the small table with the pointed knives to the center too. There I paused for a moment, and slowly lowered the girl forward with my straight arms (as in muscling out in front) until her body just about touched the shiny knives. I raised and lowered her to the knives three times in succession. After this number I made an exit and the girls came back again. This time they wore costumes that were treated with radium. 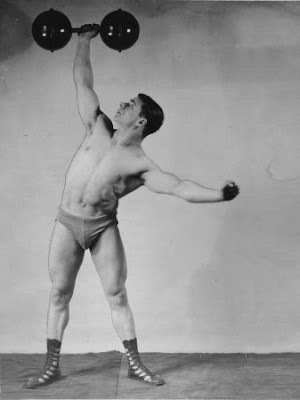 I next came back and did some juggling with the barbell and dumbell, and followed this by doing a supporting stunt, where I was suspended between two trestles that were lowered from the stage ceiling, with two steel coat hanger shaped bars. My heels rested on one and my upper back on the other. A cross bar on top attached the two hangers while four of the girls had special straps that were placed, one over my outstretched arms and one over my wrists, another over my chest, one over my thighs and the last over my ankles. The girls had these straps wrapped around their wrists securely, and the apparatus, with me supporting the girls, was now raised higher and higher until the girls were clear of the floor.